Made in Japan in 1959. Regards, Darryl. Only 3000-4000 were ever made and it is not easy to find in this condition. The top plate has a couple of VERY minor nicks. There is no corrosion. There are a few minor brightmarks. Leotax Showa Optical Works Ltd. Camera No 9205 With Leather Case. Shipped with FedEx Ground or FedEx Home Delivery. [Optical system]. This is an item from Japan. [Optical system]. [Appearance of the item]. 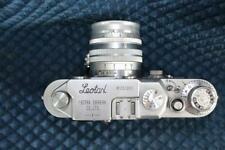 Leotax 'f' Rangefinder camera with Topcor-S f/2.0 lens in working condition, cosmetically good but used. Early versions do not have. 12848, another D IV that I own with an earlier Sn. Slow speeds recently adjusted. Swapped eyepiece of rangefinder from another DIV vastly improving view. [ Swapped out rangefinder unit with spare part from another DIV as the adjusting screw head no longer had complete slot for screwdriver.suspect prior owner had vision problems as eyepiece was for prescription (see earlier note).]. This item is sold out everywhere in Japan and very hard to get it ! It shows the twin image in the finder. This item is sold out everywhere in Japan and very hard to get it ! There is a slight dent in the bottom lid.The product performs every possible cleaning. It shows the twin image in the finder. This item is sold out everywhere in Japan and very hard to get it ! There is no fungas. There is haze. ■ Optical system. I participate from Japan. So I can provide you the best service. from JAPAN #245. Pre-owned, almost no signs of use. NEAR MINT . - Almost no dusts. tiny scuffs from normal use. Optics:　Simlar 5cm F3.5 S/N565669. This item is sold out everywhere in Japan and very hard to get it ! Including: Front cap. It shows the twin image in the finder. Including: Body cap. This item is sold out everywhere in Japan and very hard to get it ! This item is sold out everywhere in Japan and very hard to get it ! There is a slight dent.The product performs every possible cleaning. It shows the twin image in the finder. I suppose you could adjust during reassembly, for yourself. I replaced the tension springs for the 1st and second shutter cutrtains as they had been over tightened but they now operate fine. One of the locking screws for tensioning one shutter curtain stripped but can be replaced with similar if you have the tools and expertise.